The Boerne Lady Hounds (14-4) gave the Natalia Lady Mustangs (18-4-1) a run for their money and then some last Wednesday afternoon at Lady Mustang Field. Boerne out-hit Natalia 13-8 and forced five additional errors on the Natalia defense. The Lady Hounds resulted to the short-game when not much else was working and this provided the much needed spark as they rallied past the girls in blue 7-6. “Boerne was a good team to play to help us get better,” Head Coach Tamara Bednorz said. “They did a great job of putting the ball in play. Natalia Freshman pitcher Abi Woodson did a pretty good job early on versus Boerne, scattering early offensive attacks by the Lady Hounds. Woodson finished the game pitching 7.0, allowing a season high 13 hits, with one walk, seven Ks and seven runs scored, five of which were earned. Woodson started off strong, as she forced one ground out, one fly out, allowed one single and struck out one as Boerne came up empty defensively in their opening at bat. Natalia got off to the perfect start, as Freshman Taty Alvarado knocked a double up the middle which was followed by a Woodson base on balls and a Trista Vera single which scored Alvarado. Bivi Figueroa then did what she does best, she slammed a three run home-run over center field to give the girls in blue a 4-0 lead. This was her 6th home-run of the season. Boerne broke open their offensive production in the top of the 2nd, as they used a single, a stolen base and a double to get on the scoreboard. Natalia stranded one in the bottom of the 2nd before watching Boerne strand one in the top of the 3rd. Natalia went back to work in the bottom of the 3rd. Natalia’s Figueroa was walked, before advancing to 2nd on an error put into play by Mena Figueroa. Bivi scored Natalia’s 5th run of the game, thanks to a Bryana Perez single allowing the Lady Stangs to take a 5-1 lead on the Lady Hounds. In the top of the 4th, Boerne struck again, as they used a single, two stolen bases and a double to score their 2nd run of the non-district battle. The final run scored by the Lady Stangs, came in the bottom of the 4th. Natalia rallied with two outs, as Vera got on courtesy of a walk. She scored thanks to a Figueroa single and two straight stolen bases to give the girls in blue a 6-2 lead. Boerne went on to score a run in the top of the 5th thanks to two singles, a double and an error. The Lady Hounds then took advantage of three straight errors and a single in the top of the 6th to score two additional runs bringing the score to 6-5 with the Lady Stangs still in control. Natalia stranded three runners in the 5th and 6th innings combined before watching the Lady Hounds storm ahead in the top of the 7th. Boerne started off the 7th with a single to right field. They then used a stolen base and two singles to score two runs giving the Lady Hounds a 7-6 lead. In the bottom of the 7th, Natalia flew out twice before Alvarado got on with a walk. Unfortunately, the game ended with a strike-out allowing Boerne to finish off the 7-6 come-back victory over Natalia. 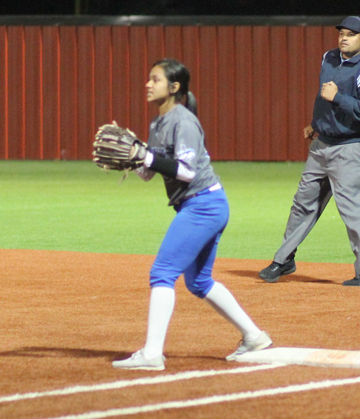 Many of the singles were bunts that provided pressure and decisions that the Natalia defense was unable to handle. At bat: Vera 1-3-1RBI-2runs scored, Alvarado 3-4-1run scored, Gabby Munoz 0-1, Gabby Contreras 0-3, M. Figueroa 0-1, Perez 1-1, Zita Perez 0-3, Woodson 1-3-1run scored, Dez Perez 0-1, Gabi Santoya 0-4-1RBI and B. Figueroa 2-3-1HR-3RBIs-2runs scored. Defensive Put-Outs: B. Figueroa 7, Contreras 3, M. Figueroa 3, Alvarado 3, Vera 3, Santoya 2. Assists: M. Figueroa 2, Vera 1, Perez 1, Woodson 1, B. Figueroa 1. Natalia was at home on press night as they opened 30-3A action versus the Cotulla Cowgirls. This Friday, Natalia jumps back into non-district action as they welcome the Pearsall Lady Mavs to town for a 5:00 and 7:00 p.m. battle. The Lady Stangs then travel to Frio County Tuesday, March 26th to battle Dilley at 5:00 and 7:00 p.m.